Orwell spent five years as a policeman in Burma, and he was responsible for the kicking, flogging, torturing and hanging of men. He saw the dirty work of Empire at close quarters and “the horribly ugly, degrading scenes which offend one’s eyes all the time in the starved countries of the East” where an Indian coolie’s leg is often thinner than an Englishman’s arm. A few years ago I read the marvellous non-fiction book, Finding George Orwell in Burma. The author, Emma Larkin (a pseudonym) travelled to Burma (now Myanmar) to trace Orwell’s life in that British colony. The book became one of the best books I read that year and confirmed my interest in Orwell–a writer I’ve always intended to get back to. This brings me to Orwell: Life and Art by Jeffrey Meyers. 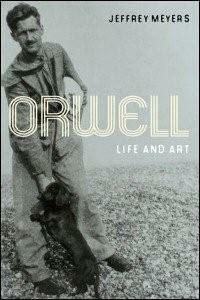 The book is a compilation of twenty-one essays on the life and work of Orwell. Meyers also authored A Reader’s Guide to George Orwell, George Orwell: The Critical Heritage, the heavy-duty title George Orwell: an Annotated Bibliography of Criticism, and Orwell: Wintry Conscience of a Generation, a biography of Orwell written by Meyers as a response to a sense of dissatisfaction with other Orwell bios. I should add that Meyers has written forty-three books to date, but it’s clear that Orwell is one of the greatest interests of his life. The range of this author’s knowledge on the subject of George Orwell makes an irrefutable argument for specialisation. The essays in Orwell: Life and Art were published, according to the introduction, “over a period of forty years,” and they cover Orwell’s life and work, analyses of his novels, and one essay even compares various Orwell bios. Since the essays were written at separate times for various audiences, some of the information is repeated, but for anyone interested in Orwell, the essays really are marvellous and substantial reading. Moreover, while the essays are by no means light reading matter, neither are they too esoteric. Meyers is extremely familiar with Orwell, his life and his work, and he isn’t afraid to make judgments at key points. Each of the essay is prefaced with some explanation from Meyers. Orwell’s books deal with two dominant themes–poverty and politics–or as he put it, “the twin nightmares that beset nearly every modern man, the nightmare of unemployment and the nightmare of State interference. Meyers admits that he’s “particularly interested in the life in the work, in the relations between biography, politics and literature,” and the essays approach Orwell from that angle. Meyers covers Orwell’s life from his childhood to his death, tracing elements of his life in these essays and always seeking to understand this strangely elusive, troubled author. The production, collection and transportation of opium to China was the most vicious and indefensible kind of imperialistic exploitation. Probably the greatest cruelty one can inflict on a child is to send it to a school among children richer that itself. A child conscious of poverty will suffer snobbish agonies such as a grown up person can hardly imagine. Orwell made an odd film critic, and Meyer notes that Orwell “rarely mentions the directors and is not interested in film as a distinct form of art.” Instead he was interested in “the political, social and moral content of film; their propaganda value; the way they reflect the progress of the war; and the difference between English and American cinema.” He loathed “american escapist films” but was fascinated by the reactions of the audience. Review copy from the publisher courtesy of netgalley . Read on my kindle.